A truly massive volume carry bag with a zip at the top. Ideal for carrying dirty laundry to the launderette or a very big shopping bag. 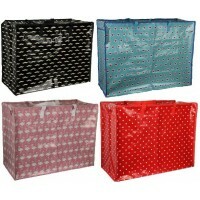 Made from woven polypropylene (plastic), this bag is available in varius colourful designs. It is plain white on the inside. 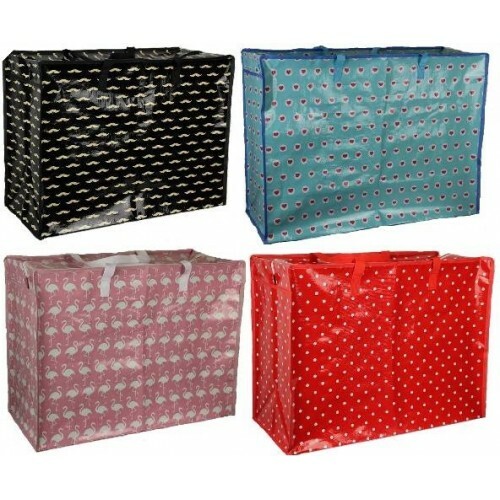 This economical bag is not for heavy use but does provide a more elegant solution to carrying dirty laundry than the common low quality multi-coloured launderette bags. Not suitable for heavy commercial use. Due to the size of the bag it is possible to over-fill. It is not intended for carrying heavy items. Corporate logo / printing available for larger quantities - please call for details. Large volume carry bag with zippped top. Ideal for carrying dirty laundry to the launderette or a bi..